Perhaps no occupation is more important in the Bible than that of the shepherd. So many of its central figures made their living at some point by making sure sheep didn’t get lost. Abraham, who passed the most important test ever given, was a shepherd, as was his grandson Jacob. Before Moses was rebelling against the pharaoh and receiving commandments, he too ushered the sheep around. And even King David was tending to his flock before he tended to all of Israel. The preponderance of shepherds in the Bible makes sense on a couple of levels. First of all, there were simply a lot of shepherds in biblical times, so the odds were pretty strong for getting a shepherd if you just picked anyone out of the crowd at random. But of course you can’t deny the metaphorical level, that we’re all bumbling sheep under the auspices of the Good Shepherd himself. Who knows how many of us would still have our heads stuck in fences if not for occasional help from upstairs? 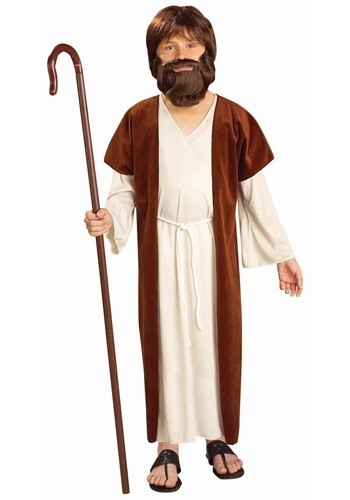 If your child needs to play a prophet in a school or church play, or they just want to look like they had business taking care of sheep a few thousand years ago, then this costume is their best option. With these two robes and belt they would have fit right in in ancient Damascus. All they’ll need is a shepherd’s crook, which we have a selection of, and a beard if they’re really going for authenticity. Maybe better you shouldn’t wait for them to grow their own! Great price and costume was very comfortable.